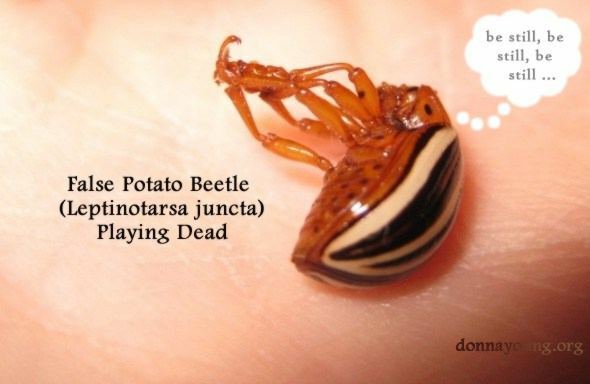 The Potato Beetle is Clearly "Dead"
While walking through the vegetable garden the other day, I glanced down at my eggplant and saw an interesting dead beetle. I brought it inside and placed it in a small container on my desk. The next day, the beetle was walking around the inside of the container. The potato beetle was clearly alive. So, I touched it with my finger and it fell down dead again. Later, I placed a snippet of eggplant leaf in the container and the next morning, the leaf was gone. Before I let it go back outside, I made a time lapsed video of the beetle playing dead. The beetle first twitches at around 15 seconds. Near the end of the video, the beetle climbs to the top of the cup; I touch it, and it drops dead once more. After this, I released the beetle outside. Shortly before I set the beetle free, I took a few close up photographs. 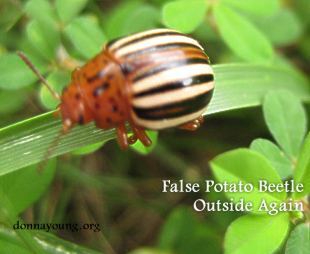 False potato beetles can be confused with Colorado potato beetles. According to wikipedia: "The two species, L. juncta and L. decemlineata, can be found on the same solanaceous host plants but are apparently incapable of crossbreeding. 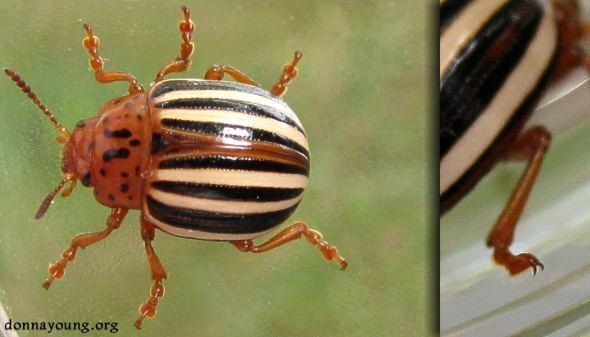 Of the two, only the Colorado potato beetle is a serious pest." The video and photographs were made with a Canon PowerShot. Specifically the Canon PowerShot SD1100IS. We bought it May 2008, and naturally, there are newer models now. As of today [July 2010], the newest one is ELPH 100HS. For the video, I used the time lapse setting and macro. Some of the photographs are taken under the setting of "digital macro" and some are just macro.